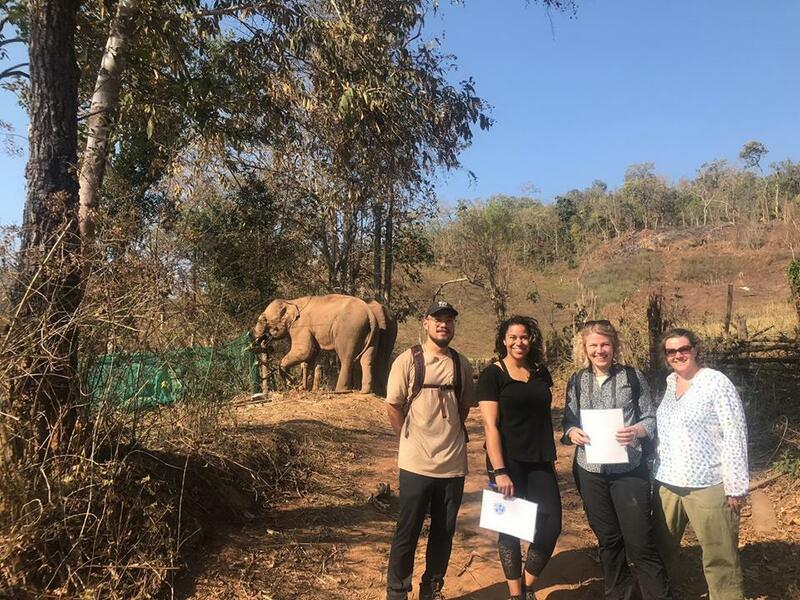 The first weekend of March saw the Kindred Spirit team forgo relaxing in the comfort (re: hammocks) of KS base camp, and instead embark from Ban Naklang Village on a cave sleep-out to raise funds for the continued support of Too Meh, the oldest of the KS elephants and matriarch of the family, and her daughter Mae Doom. 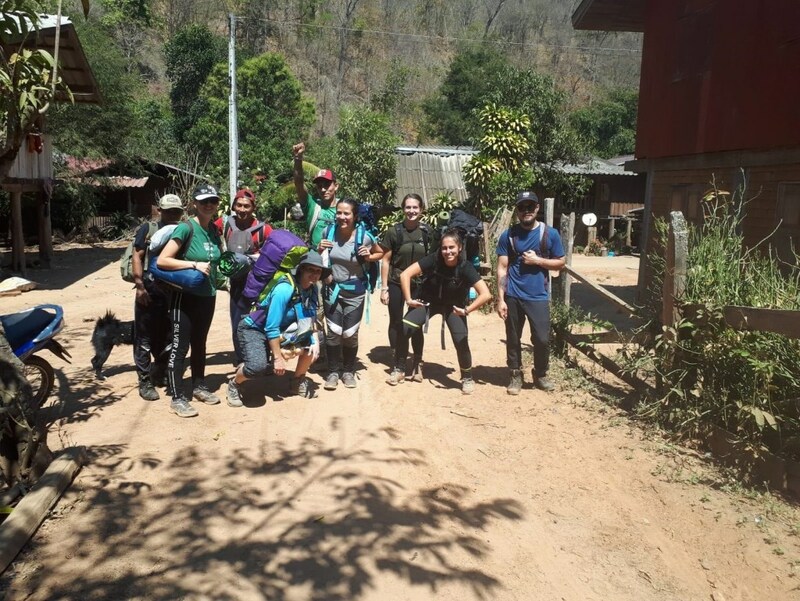 After completing our normal duties on the Friday morning elephant hike, we stuffed our packs with the bare essentials (a category including too many socks for an overnight trip, a Perry the Platypus pillow and 18 hard boiled eggs) and set out on foot for the cave! The expedition led us through the heart of a nearby rainforest, which provided a beautiful but challenging route to the cave. Highlights included a waterfall that the team courageously climbed up, and a waterfall of Harvestman spiders that the team foolishly walked under. Even under the protective canopy of the trees, the 30°C+ heat was itself a force to be reckoned with, and some of the sweatier members of the group took to sampling the refreshing water of the rainforest using a lifestraw! After about 3.5 hours, we finally reached the cave entrance and were greeted by a beautiful Buddhist shrine, and marveled at the effort required to have carried it through the forest. Still feeling adventurous from the trek, we set down our packs and ventured into the depths of the cave, encountering various species of small bats and spiders along the way. The last of our wildlife encounters came at dinner, when we were joined by some of the villagers who had just finished hunting and prepared a squirrel stew with coriander and garlic for their dinner. It was both incredibly interesting and humbling to watch the speed and proficiency with which the meal came together, and, being offered a seat and a bowl of rice when it came time to eat, I can say with certainty that it made for a much more fulfilling meal than the instant noodles we had brought for our own dinner. I later learned that I had eaten the squirrel’s testicles, but I stand firmly by my initial judgment. Unfortunately, despite our best efforts to clear the carpet of rocks and pebbles beneath our sleeping bags, the night was not particularly restful, and by breakfast time we were all eager to make it back to Ban Naklang for a shower and a nap. This newfound motivation and the lighter load (no hard boiled eggs remained at this point) pushed us to hoof it back in just over 2 hours! Sombat and the other accompanying villagers, who had completed the hike effortlessly in just flip-flops, did not understand our elation. With everyone back safe (just a little bit sleepy) and Too Meh and Mae Doom’s residence with Kindred Spirit in safe hands, the fundraiser was a huge success and an unforgettable experience for the team. Thank you to friends, family, volunteers, and everyone else who contributed to the fundraising event!